When you find a place that steals your heart and draws you back time and time again it begins to feel like home. This is what Montréal, Quebec feels like to me…home. This is also why when I went up a few weeks ago I decided I wanted to stay in an apartment rather than a hotel. But I’m not talking about Airbnb or VRBO. 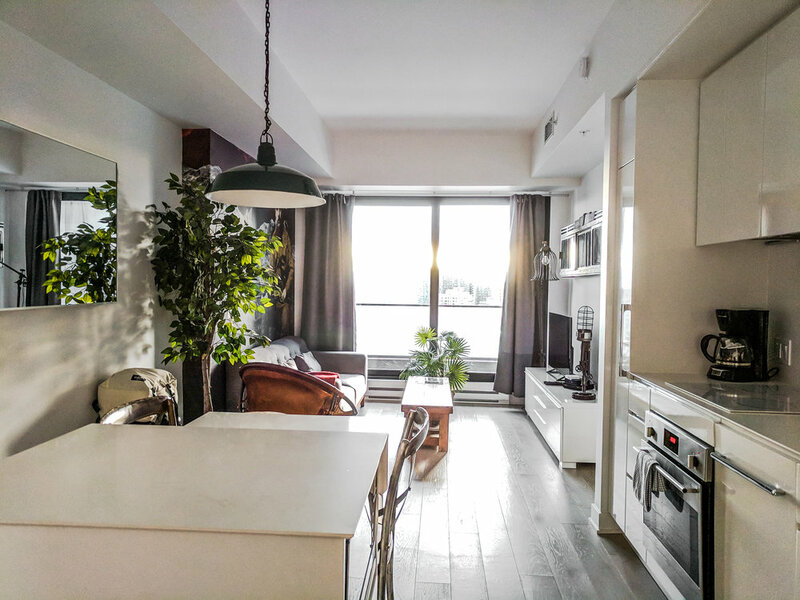 I’m talking about a site that I found that offers gorgeous units in prime locations all throughout MTL. The best part? They offer all the comforts of being at home with the amenities of a hotel. Besides it’s always better to feel like one of the locals rather than someone who is just passing through. Montréal is a city bursting with creativity. Montréalers know that innovation is key in life – which is why you will find some of the most exciting gastronomy and mixology happening here. The people at LikeAHotel know this and know that something that goes hand in hand with this innovation is comfort. Sure you may not get room service (you’re trying to visit like a local anyways) but what you’ll get instead is a memorable experience in a better location than that budget hotel you were looking at. This is why I love LikeAHotel so much – they know you are looking for the local experience, so they make sure their rentals are strategically placed throughout the city. And not only that the décor in each of them is on point! I stayed in two separate locations, both location in downtown MTL. And full disclosure this was actually the first time I have stayed downtown. I usually stay in Old Town or in the Plateau, but I must stay it was a great experience. And similarly to the financial district here in NY downtown MTL starts to get quieter at night, which is nice. My first apartment was located on a quiet, homey feeling street. The best part about this place is that aside from the slightly assuming logo above the door you would literally have no idea that you could stay in this building. It was an older building on Rue Mackay very similar to many of the apartment buildings you will see walking around the city, but surprisingly the apartment was very modern. And huge! I loved the layout of the apartment as you walked into a long hallway which led to the galley kitchen, sitting room and slightly hidden bedroom. The pop of red throughout the interior was so fun – literally this is what I want my own apartment to look like. My last night I moved a few blocks away to The Canadian Towers – which let me tell you is luxury on luxury. This is a place I would probably never be able to live in my real life but I thoroughly enjoyed spending my last night here. This is where I must stop and give a HUGE shout out to LikeAHotel! Most check-in and check-out times are not convenient, so when I needed to move locations I wasn’t really sure what I was going to do with my bag. And I’m sorry but there was no way I was going to drag my suitcase around the city when the whole place was basically an ice rink. But like Superman the lovely humans at LAH came to the rescue and offered to move my bags for me! What gems! So after checking out of Mackay I had to do nothing else other than show up at The Canadian Towers in time for check in. Once I got into my new unit there my bags were! The building is definitely not hard to miss – especially when there is a Canadians game happening (it’s located adjacent to the Bell Center). Fun fact: This building is also the only high-rise building connected to the Underground City. In addition to my unit also being unbelievably large and supremely decorated, the building had amenities on amenities. There was a terrace and outdoor pool (unfortunately too cold for that during my visit), BBQ area, a spa, gym, game rooms, a yoga studio and a concierge at the entrance. My condo had a stunning view of the city and the most fabulous wall art in the sitting room. This was one of the things I loved the most about this unit, the décor. It was completely rustic chic which I am a huge sucker for. I don’t know if it’s my recent obsession with Westworld but I am all about this look these days. This was also the one night I decided to stay in. After 4 days and nights of exploring I was slightly exhausted and just wanted to chill, eat takeout and watch Netflix (I think it’s better in Canada anyways), and that’s exactly what I did and had no regrets. Because I only had one night at The Canadian Towers I couldn’t fully enjoy all of the amenities, but I think it’s the perfect place to base yourself during a winter visit. If the weather is absolutely disgusting or unbearably cold, then this building has got you covered on activities! LikeAHotel makes the check-in and check-out process so amazingly simple and DIY (so to speak). You call them 45 minutes before your arrival (so basically once you land) and they will give you all the codes you need for your unit. Now based on where you are staying these can vary, for example if you are in a luxury building with a reception desk there probably won’t be a front door code for you. But in general your codes will vary from a front door code to a locked key box code. Even though there is no one from LAH on-site they are available 24/7 and are just a phone call away. I literally called them at least once a day with a question and they were more than happy to help me out. Like I mentioned earlier, we all know that no matter where you are staying check-in and check-out times are rarely convenient for anyone. LikeAHotel knows this and are more than willing to store your bags at their home office location in the Plateau. I was welcomed as a guest of LikeAHotel while in Montréal - as always all opinions are my own. But I’m sure as you all have started to find out, I really only partner with places that I know I will most likely love and will provide an unforgettable experience.